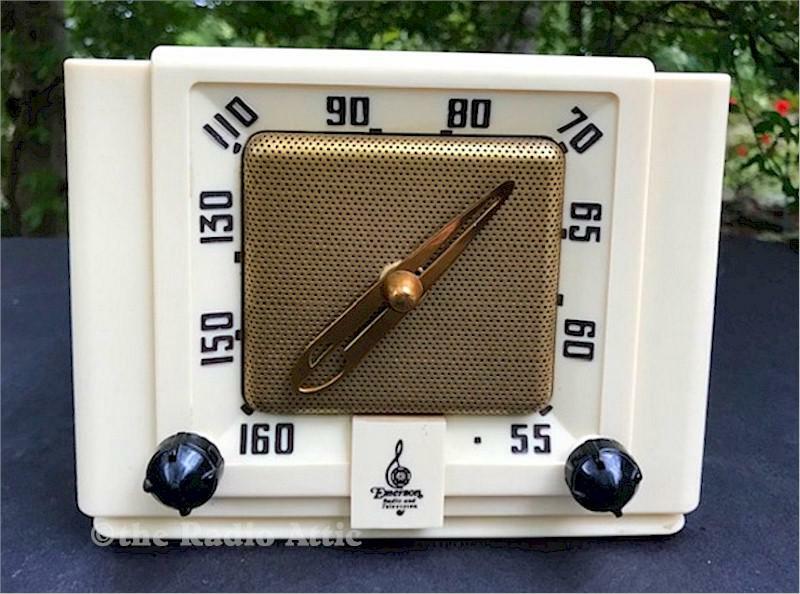 Super cute 1949 ivory Polystyrene plastic Emerson "Clockette" in perfect condition. This case is in excellent condition and has no chips, cracks, chips or tube burns. It is a very hard radio to find without some type of damage as they are very light and fragile. It's a midget sized radio at only 6-1/2"W x 5-1/2"H x 3-1/2"D. They just don't get much smaller than this. The clock face and brass grille give this midget Emerson a very distinctive look. The brass dial pointer is the same pointer that Emerson used on the 1937 model 157. It is a five-tuber with a built in loop antenna. Reception is very good. At night I was able to pull in many distant stations. You are visitor number 448 to this page.